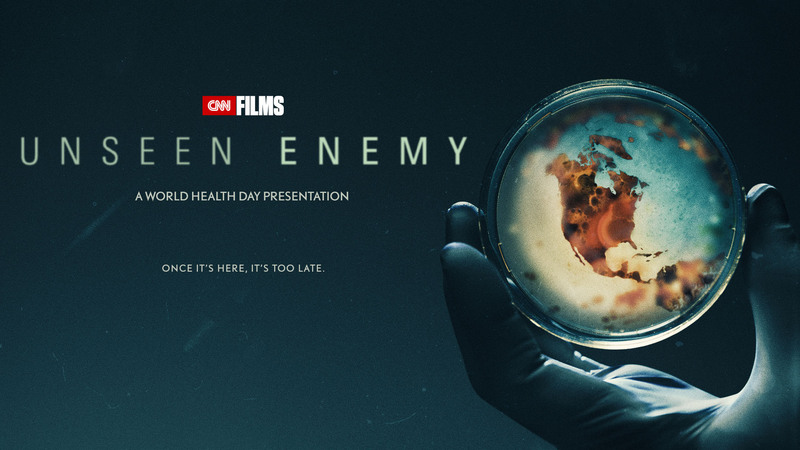 UNSEEN ENEMY, about the potential looming crisis of disease pandemics, will debut as a CNN Films broadcast for a World Health Day presentation Friday, April 7 at 10:00pm Eastern on CNN/U.S. The film is exclusively presented by Johnson & Johnson. All broadcasts will have limited commercial interruptions. UNSEEN ENEMY is narrated by Emmy® and Golden Globe award-winning actor Jeffrey Wright and is written and directed by award-winning filmmaker Janet Tobias. CNN’s chief medical correspondent Sanjay Gupta, MD, is an executive producer and consultant for the film. Philanthropist Paul G. Allen, known for his catalytic leadership during the 2014 West Africa Ebola outbreak, is also an executive producer. While the headlines of deadly outbreaks are alarming, Tobias’ film makes the case that successful containment can be achieved with coordinated efforts of medical professionals, researchers, governments, communicators, and the public. Two historic examples support her case. World-renowned epidemiologist Dr. Larry Brilliant, guides viewers through his difficult decisions as he worked on the teams that forcibly vaccinated the last remote villagers against smallpox. Others describe how the global spread of HIV/AIDS could have been stopped if governments and public health bodies had acted more deliberately to warn the public. Dr. Brilliant warns now that there may be 30 emerging human pathogens that have the potential to become epidemics. Unseen Enemy is produced by Roger Lopez, Janet Tobias, Peter Klein, and Michael Ehrenzweig of Sierra / Tango Productions. The executive producers are Paul G. Allen, Jody Gottlieb, and Carole Tomko, for Vulcan Productions, Amy Entelis of CNN Films, CNN chief medical correspondent Dr. Sanjay Gupta, Sabine Rollberg, and Jeffrey H. Field. The supervising producer is Courtney Sexton of CNN Films. UNSEEN ENEMY is co-produced by Sierra / Tango Productions and Vulcan Productions. Vulcan Productions is dedicated to the power of storytelling. We produce content and large-scale campaigns that entertain, inspire and change the way people understand the world’s toughest challenges. Our films, television series and digital content spark ideas and turn action into measurable impact. Founded by Paul G. Allen and Jody Allen, Vulcan Productions creates content across all platforms, and spotlights Mr. Allen’s work in wildlife, science, climate, oceans, education, technology, current social issues, history and the arts. Our award-winning projects include The Ivory Game, Racing Extinction, Naledi: A Baby Elephants Tale, Academy Award®-nominated Body Team 12, Mind of a Giant, We the Economy, We the Voters, Ocean Warriors, #ISurvivedEbola, Girl Rising and The Blues. Upcoming releases include STEP and Unseen Enemy. For information on Vulcan Productions and our leadership in generating change through impact storytelling, visit www.vulcanproductions.com. At Sierra / Tango Productions (www.sierratangoproductions.com), we believe that a story has the power to inspire change. With every film project our goal is to open a window on a world. We aspire to tell stories that motivate audiences to talk, care, and act. We’ve produced over 20 documentaries on subjects as diverse as: the Holocaust, the American criminal justice system, advances in neurosurgery, and teenagers in the 21st Century.. Sierra / Tango’s most recent theatrical film, No Place On Earth, the story of the longest uninterrupted survival underground, debuted at the Toronto Film Festival, and was released in the U.S. by Magnolia Pictures, and in Germany by Senator. Sierra / Tango is currently in production / development on films about the world memory champions and the U.S. juvenile system.